“…donations are a pain…” you tell us - we can take that pain away! YES - we handle every form of donation. Others are only interested in card donations, ours is a complete system managing every form of donation: the collection, cheques and online card donations, it is a complete donations management system. YES - every online donation is acknowledged via an email from you, the funeral director, acknowledging receipt - you can also generate acknowledgement letters for cash and cheques received. YES - families can collect for any group - they don't have to be a registered charity- most systems collect for registered charities only. So long as you are happy with the validity of whats being collecting for, you can collect for it. We increasingly see “crowd funding” to help meet the cost of the funeral. It's your system, you retain 100% control. YES - Adding Gift Aid is easy, its a single click to add Gift Aid to a donation - 4 out of every 5 of online donors do! Meaning the collections are on average circa £80 more. YES - It’s your service, in your website, with your branding. InMemory carries no branding, it drives donors to your website, not ours, and is your service, not ours, helping raise your profile within your local community it even allows you to grow your mailing list (should you wish to). Our research shows, that for every 100 funerals undertaken, funeral directors' teams having circa 1400 donations to record - that's about 6 weeks work! We automate most of that administration burden, giving you more time to spend with your families and community. Thanks to our collaboration with Reach, the largest regional newspaper publisher in the UK, you can now, in a single click, link an obituary notice in a Reach publication to a Cloudberry donation profile at no cost. Meaning that anyone viewing a notice on their funeral-notices portal can donate directly into the Cloudberry profile for that person. The system records the donation, the donor receives an email acknowledgement from you and the funds go into your donations account. So this widens the donations net further, without increasing your workload. Increasingly, people rely on payment cards, this trend will only increase as cheque payments dwindle. People increasingly donate online. In fact, last year 14% of all UK donations we're made by donors online, an increase of 6% on the previous year. 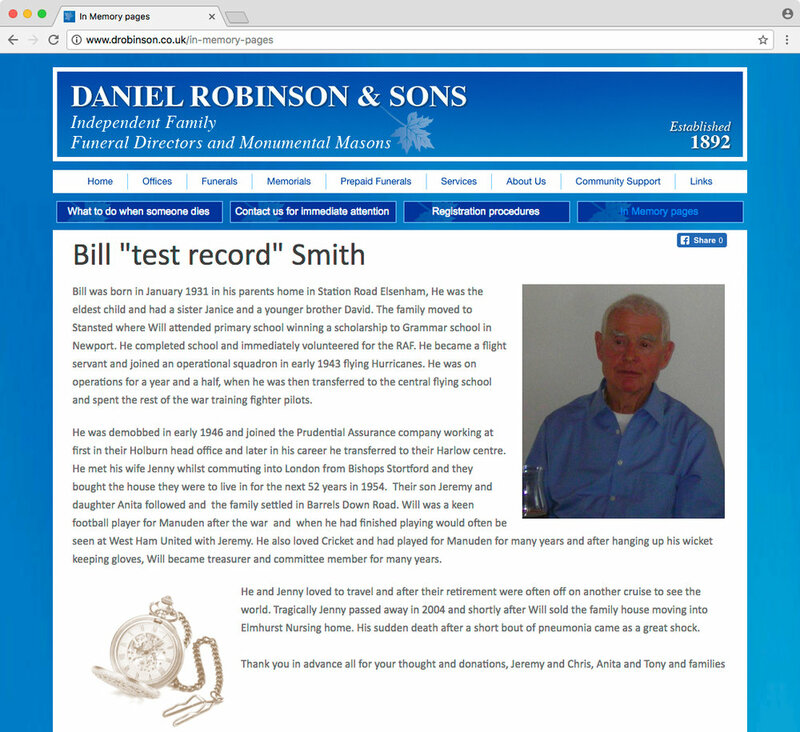 ‘InMemory’ is inserted into YOUR website, totally unbranded, so when donors visit, they see it's your service and stay on your website to use it. From the dashboard you can easily create each page, adding the funeral details, select the charities, add the photos and life story. “Traditional donations” e.g. cash or cheque are added when received, online donations are added automatically in real-time. Analysis shows that consistently 80% of electronic donors add Gift Aid – boosting those donations by 25%. We calculate this increases the average donation total by £80 – so using the 'InMemory' Donation Management System helps boost charitable donations by around £8,000 per 100 funerals. See exactly how 'InMemory' works, and how it will look in your website here. Since using the ‘InMemory’ system, we have seen our website traffic increase from 300-400 hits per month to 3,000-4,000! This has enabled us to grow the business and provide a service that exceeds expectations. Find out more or arrange a no obligation demo? Simply complete the form below. Thank you for your enquiry - we'll be in touch shortly. !